I have been playing a classical guitar for some years now and I recently purchased a steel-string acoustic guitar. I am puzzled by the placement of the bridge saddle on my steel-string. On my classical guitar the bridge saddle is placed exactly parallel to the nut. On my new steel-string, the bridge saddle is placed at a slight, but noticeable angle to the nut. 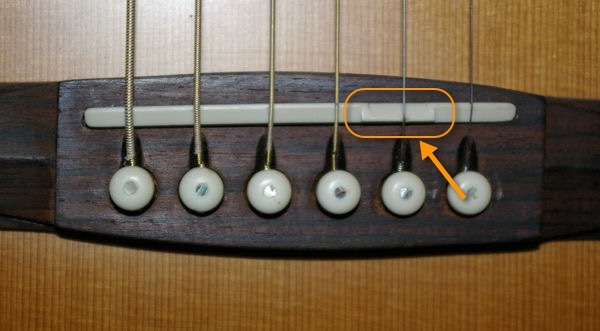 This appears to be a common feature of steel-string guitars. Physical law says that the pitch of a vibrating string is raised an octave when its length is divided exactly in two. So why would a guitar maker choose to violate this law? I don't believe that thicker gauge strings obey different laws. The difference is that the nylon strings on the classical are all close to the same diameter, whereas on the steel string the diameter of the smallest string might be about 20% of the size of the diameter of the largest. This matters because the physics you have learned is simplified. Only string that have no thickness and no stiffness exactly fit the model, and of course such strings don't exist. Since real strings deviate from the ideal model more or less depending on their thickness, the sounding lengths need to be adjusted slightly to try to keep the intonation even across the frets. This compensates for the reality of the string geometry and so the angled saddle (technically the bridge is the bigger piece of wood glued to the top, the angled thin piece of bone is the saddle) is called a compensated saddle. Compensated saddles cannot make intonation perfect, in fact all intonation on fretted instruments is a compromise. But at least a compensated saddle is a straightforward way to make the intonation a lot closer to perfect for varying string thicknesses. You are incorrect in your assertion that there is a physical law being broken here. A guitar has six strings of different diameters, different materials (some strings are a plain length of steel wire, whereas others have other wires wrapped around the steel wire core) and tensile strengths, tuned to different pitches. As a result, there must be a compromise in the setup and intonation of each individual string to account for several factors to make the guitar play more-or-less in tune. And tuning and intonation are always a compromise -- they can never be exact. If your guitar had, say, 6 plain "e" strings of the exact same diameter and composition all tuned to the same pitch, then it would be appropriate to have a bridge saddle that is perfectly straight and perfectly perpendicular to the direction of the strings. But your guitar has six strings, each of a different composition and thickness, each tuned to a different pitch, so it is necessary to compensate for these factors, which is why the bridge saddle is slanted. Furthermore some luthiers go farther than this and construct a bridge saddle that has a different string length under each string. Note the example below, where the saddle position for the high "b" string is notably moved back and longer than that of the "e" or "g" strings. 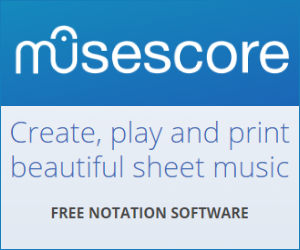 This is to achieve better intonation. Everything I have read is correct but one major point is where the fulcrum is, at both the nut and the saddle effects intonation the most with a properly made steel string acoustic guitar. It is very hard to see and make the actual fulcrum point correct. The nut is usually filed by hand using eyesight but if you look at each string slot they are always off, one way or the other. It may appear to be a very small difference but that is the trick to intonation. That is why your E string sounds out of tune at the 12th fret. That little difference amplifies itself as you go down the frets. At the 12th fret your string should be cut in half but you have something off. Most makers try to compensate at the saddle. Buzz Feiten created a nut compensation setup. It is unusual and if you read about it you will scratch your head and say when will it end. Very simply getting the actual high point on the nut (the fulcrum) and the same on the saddle, you will be close but is the actual high point on each fret correct and was it placed at the exact position? This is where the math comes in. On my personal guitars I set them up a little at a time because so many things can alter the overall dimensions. High or low humidity can move your neck, the bridge and top of the guitar will drop down or go up depending on humidity and temperature. Your guitar is always moving. I don't try to fix everything at once but over time I listen to differences. One thing I do is listen to each string plucked open than I fret it and listen for clarity. 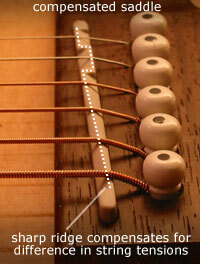 If it sounds better fretted the nut is pinching the sides of the string or the fulcrum is wrong. I take my saddle and polish it with 600 emery cloth then 0000 steel wool. I use a gem eye scope and look at each point on the saddle and make sure it is right. I do the same on the nut. So many things affect the intonation all you can do is get everything correct according to all the information luthiers have passed on and if you have anything to add to it than do so. People are very creative and someone will come up with a way to get it perfect. Machines have been made to do all of this but it still comes down to all the little things that can be off by microscopic differences. I get it right over time and always keep my guitars comfortable with the right temperature and humidity. One last thing, strings are all a little different. Playing around with different string brands and type may also help . You have to have a very good ear and some very good tuners that can be placed at different points on the guitar giving me slightly different readings. Think about a violin, your finger placed at exactly the right place creates the intonation. Guitars have frets, nuts and saddles to do this so listen to anyone that has an idea and you will learn. There is no such "physical law". An octave interval is distinguished by a doubling of frequency. That is a mathematical law. A string that is infinitely thin and has no resistance against bending while having a certain tension and mass density will in first order approximation have an oscillation frequency for small amplitudes that is proportional to the string length. Physical strings are not infinitely thin, have thickness- and material-dependent resistance against bending and will change length and tension (depending on the clearance of its setup) when pressed against the fretboard rather than being divided with something like a bottleneck. If you want to look at the differences needed to accommodate differing strings properly, you will not be able to apply "physical laws" that magically disappear while you thicken a string until it becomes a rod. Not the answer you're looking for? Browse other questions tagged guitar acoustic-guitar intonation bridge or ask your own question. Why is there a notch in a guitar's bridge where the B string crosses? Does an adjustable bridge need to be parallel to the frets? Does the guitar's bridge affect the tone? Adjusting a string saddle back, making the string longer, reduce sharpness or increase it? What's the purpose of the dual saddle on my 12-string guitar?